The Whitedeck Santorini complex is located in Imerovigli, at the highest point of the island, above the famous volcano and opposite the medieval Orthodox Maltese church. At sunset it offers magnificent views of the caldera. 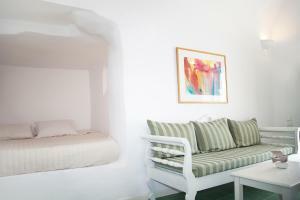 This junior suite overlooks the caldera, the sunset and the volcano from the semi-private terrace and is located on the top floor. 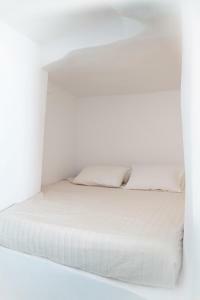 It also has 1 bedroom with 1 double bed and seating area, as well as luxury mosaic bathroom with shower and toiletries. The wooden structure offers privacy. Guests can start the day with a breathtaking view and breakfast in their room. You can choose your own personalized breakfast from a variety of Greek ingredients every day, as well as the time you want your breakfast to be served. This suite is on the top floor and has a private terrace with a private outdoor hot tub (not isolated), a 1 bedroom with a double bed 1 and a living room with a sofa. The luxury mosaic bathroom has a shower and toiletries. In addition, there are views of the caldera, the sunset and the volcano. The maximum capacity is for 2 people. This superior suite is on the top floor and consists of 1 bedroom with 1 double bed, living room and luxury bathroom with walk-in shower. The private terrace is in front of the suite and the private balcony is on the suite (not isolated) and has sunbeds with views of the caldera, the sunset and the volcano. The maximum occupancy is 2 people. This suite, with views of the caldera, the sunsets and the volcano, is located on the top floor and has 1 open-plan bedroom with 1 double bed, and luxurious bathroom with shower cabin. Outside there is a solarium for private use (not isolated) with sunbeds on the suite, and a balcony next to the entrance of the suite. Guests can have breakfast in the rooms and enjoy stunning views. Guests can also choose breakfast time and customize its ingredients among a selection of Greek products. This open-plan house, located on the ground floor, has 1 bedroom with 1 double bed, and living room with sofa, a dining table and kitchenette. 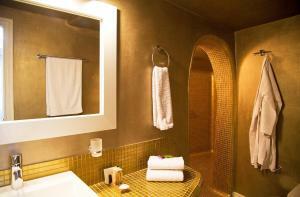 The house also includes a luxury bathroom with mosaic shower and toiletries. Above the house there is a private balcony (not isolated), accessible by means of an interior staircase, overlooking the sea, sun lounger and 2 armchairs. The house has views of the volcano, the caldera and the sunsets.